This is the right tail light for GM trucks. It is for 2007 to 2014 Chevy trucks - Silverado, Sierra, Yukon, Suburban, GMC, some Escalades. It has the bulbs and wiring harness. I do not have a way test it but I have no reason to think it does not work. It is in excellent used condition. There are no breaks or cracks . It has a couple tiny pits and a few slight scrapes but overall is in excellent condition. 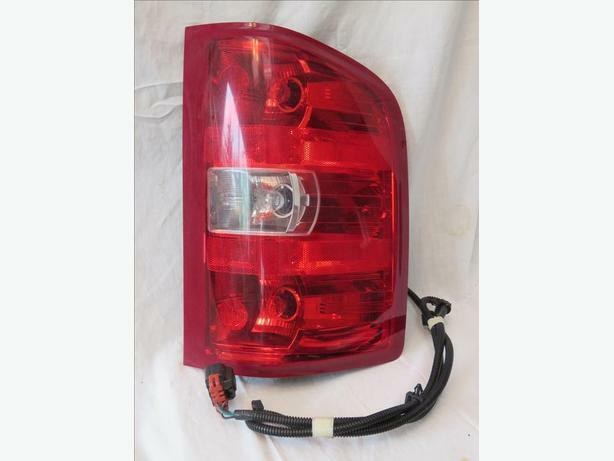 GM dealer said the price for this tail light is $270.40. It was actually More online plus shipping. Priced at only $80 That is over 70% off! I will ship anywhere for my costs. 250-656-0549 No Saturday or Friday evening calls. I have a large selection of small appliances for Sale or Rent.